With "Fibonacci Time Zones" EA you can draw Fibonacci Time Zones on the chart and trade with price breakthrough,has 3 buttons for manual trading and allows to predetermine trailing stoploss & take profit, open and close all trades at once. But a one-time function with a smaller value than the subsequent Stop Loss value to lock minimal profit and avoid loss if the price goes against you. WHENTOMOVETOBE - When to move break even (values: 10-100). 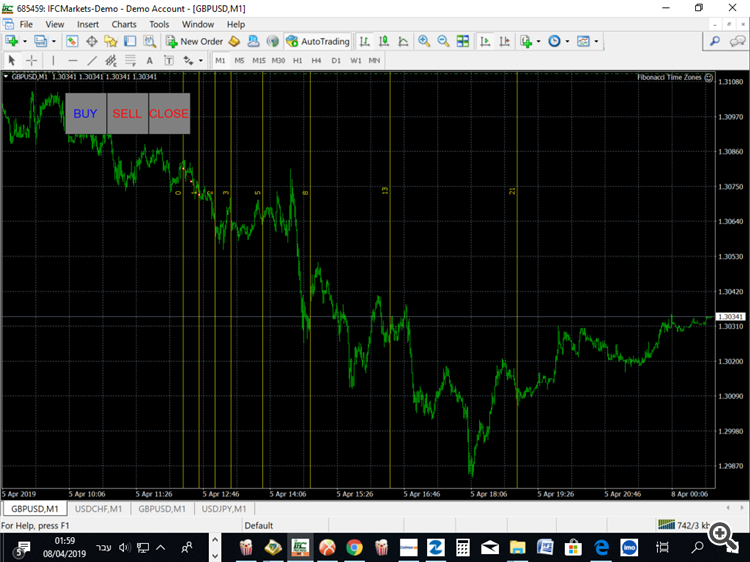 PIPSTOMOVESL - How much pips to move stop loss (values: 10-100). USEMOVETOBREAKEVEN - Enable "no loss" break even system (values: 0-1). USESTOP - Enable automatic "STOP" function (values: 0-1). Lots - Lots size (values: 0.01-10). MaximumRisk - maximum risk from total margin in %, (values: 0.01 - 0.3). If "MaximumRisk =0" then "Lot=constant"
DecreaseFactor - decrease from total margin if you lose a trade. TrailingStop-set a value from 10 to 100 to activate trailing stop loss & take profit, "0" will not activate trailing stop loss. Stop_Loss - Stop Loss (values: 10-100). MagicNumber - Magic number (values: 1-100000). TakeProfit - Take Profit (values: 10-100). The indicator plots Pivot levels for 3 custom periods on chart. "Breakthrough volatility" breakdown robot scalper. With "Equidistant Channel" EA you can draw Equidistant Channel on the chart and trade with price breakthrough or trend,has 3 buttons for manual trading and allows to predetermine trailing stoploss & take profit, open and close all trades at once.